If you were attending class at 7:30 a.m., could you get excited about flies? No? How about the gender differences? Still no? You would if Mary Frances “Fran” Keller were there teaching you. You won’t find anyone more enthusiastic about entomology than Fran Keller. A doctoral candidate in entomology, she recently received an outstanding teaching award at UC Davis. 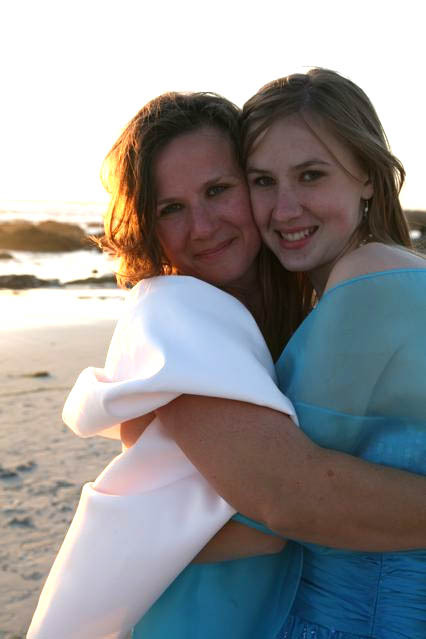 She's amazing. Take it from pre-med student Shawn Purnell, one of Keller’s students. “My perception and expectations of teacher assistants were forever raised when I met Fran,” he said. If it creeps or crawls or flies or jumps, Fran wants to know about it. She's especially partial to tenebrionids or darkling beetles (see her Web site). 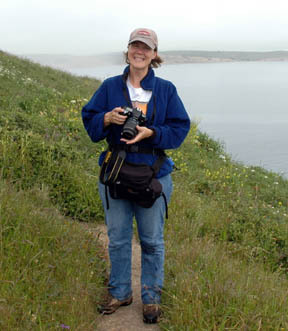 She’s also an accomplished artist, illustrator and nature photographer. And a wife and mother of two. Her four years as the teaching assistant (TA) in an insect physiology class taught by Charles Judson, emeritus professor of entomology and professors Bruce Hammock and Walter Leal, led to the teaching honor. The trio nominated her for the award, which Chancellor Larry Vanderhoef presented to her at a May ceremony on the UC Davis campus. "It's reassuring to know that out of a maze of 30,000 students and faculty at Davis," he said, "that there are people like Fran who really care." Fran, scheduled to receive her doctorate next June, studies with major advisor Lynn Kimsey, director of the Bohart Museum of Entomology and chair of the Department of Entomology. The doctoral candidate is based at the Bohart Museum of Entomology, where she also designs museum posters, such as the Butterflies of Central California, Dragonflies of California, California State Insect (California Dogface Butterfly) and Pacific Invasive Ants. Currently she's coordinating a sale of gift items listed on the Bohart Web site. Proceeds benefit the museum's outreach program. What’s she been up to lately? I hope you're sitting down! This fall she will be TA’ing Entomology 100 with her major professor Lynn Kimsey, who describes her as "one of my most gifted students ever." She's an invited speaker for the first California Desert Research Symposium (CDRS), set Nov. 8 at the University of the Redlands. It's billed as "the first biennial CDRS, contributing to the understanding and conservation of desert wilderness. Fran is also organizing the Coleoptera symposium at the Entomological Society of America annual meeting set Nov. 16-19 in Reno. She'll deliver a presentation on Stenomorpha. And for all you dragonfly enthusiasts out there, she's designing a new dragonfly t-shirt for the museum gift shop. And about those flies she so eagerly discusses at 7:30 in the morning? How much time do you have? No, this isn't a bank heist or a gas station hold-up or a home invasion. A carpenter bee is slitting the sides of salvia (sage) to steal the nectar. Floral larceny! Book 'em, Danno! Carpenter bees are nectar robbers. Nectar robbers pierce or bite into the corolla of a flower to remove the nectar. They can be birds, insects or other flower visitors. But wait, nectar robbers aren't all that bad. They pave the way for our beloved honey bee to gather nectar. The carpenter bee is often mistaken for a bumblebee because of its size and color. The most striking difference: the carpenter bee's abdomen is shiny, smooth and black, while the bumblebee's abdomen is fuzzy, covered with dense black and yellow hairs. 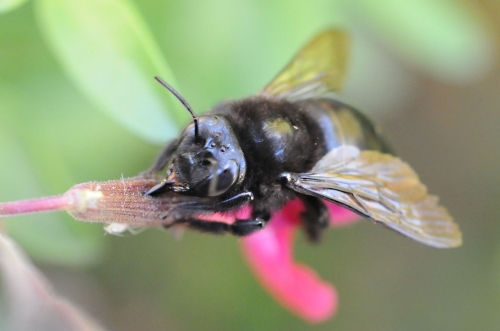 Unlike the bumblebee, the carpenter bee is a pest. 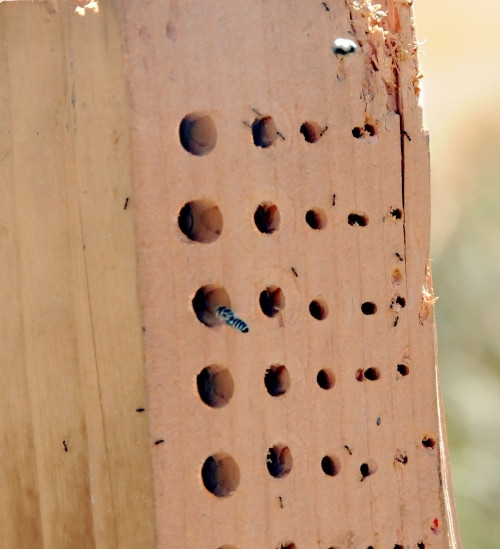 To make its nest, the C-bee tunnels into wood, often weakening structures. It's a fairly decent pollinator, however, when it lands on open-faced flowers. The C- bee can't creep into a tubelike flower to steal nectar, so it bites a hole into the corolla with its proboscis. It's a show of force. An end run. Touchdown! If you see a floral larceny in process, don't dial 9-1-1 or consult Section 211 of the Penal Code. Just think of our besieged, beleagured and embattled honey bees that will benefit from this "act of crime." We've all heard of the cuckoo clock. And most of us have heard of the cuckoo bird (Cuculus canorus), which lays its eggs in the nest of birds of other species. Yes, there is a cuckoo bee. 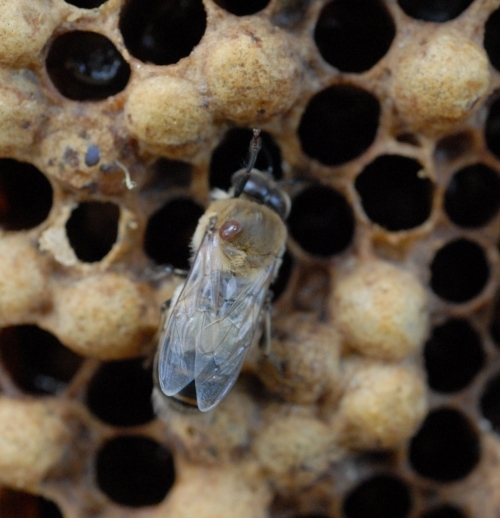 The female lays her eggs in the nests of other solitary nesting bees. They resemble wasps. You can see these slender-waisted bees hovering low to the ground, sneakily searching for burrows of other solitary nesting bees. Like an identity thief, they try to avoid detection. They slip into a a burrow and lay their eggs in the host's nest. 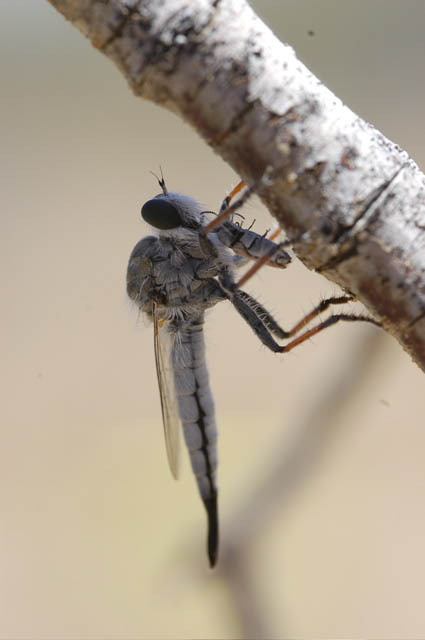 The hatched larvae then eat the host's food and parasitize (kill and eat) the host's larvae. Some cuckoo bees are more abrupt and don't smuggle their eggs into a nest. In Insects of the World, Walter Linsenmaier writes how a few species of Sphecodes, invade the nests of mining bees (Halictus), and "with naked force when necessary" slaughter "everything that opposes them." Then the cuckoo bee flings the opposition out the entrance. Did anybody say "cruel world?" Cuckoo bees are not nice and they're not ready to make nice. If this is a world of The Givers and The Takers, then they're the takers. I captured this image of a cuckoo bee last week. Said Robbin Thorp, emeritus professor of entomology at UC Davis: "It's a cuckoo bee, probably the genus Triepeolus (maybe Epeolus) and probably a male." No, a bee nesting block. Think "bee condo." 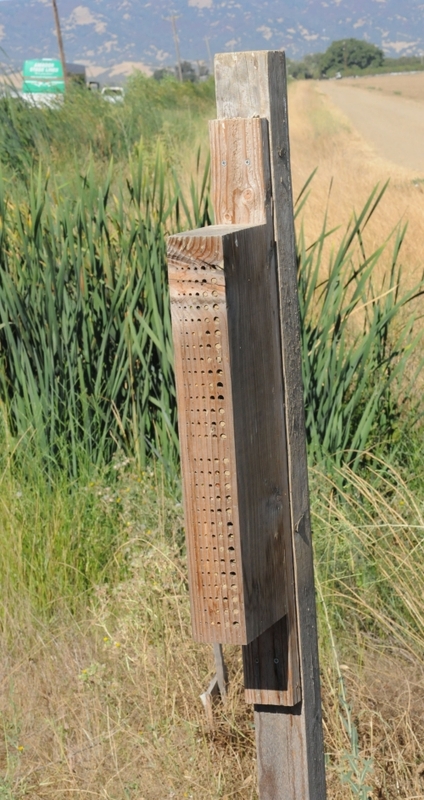 It’s an artificial nesting site made of wood and drilled with different-sized holes and depths to accommodate the diversity of native pollinators. Often the bee block is nailed to a fence post. 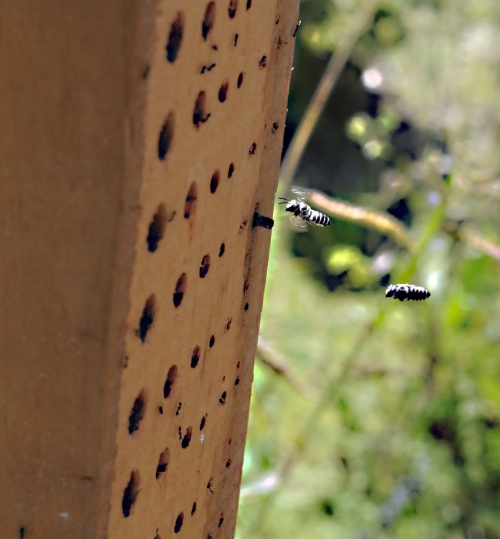 Native bees, such as leafminer bees and blue orchard bees, build their nests inside the holes. 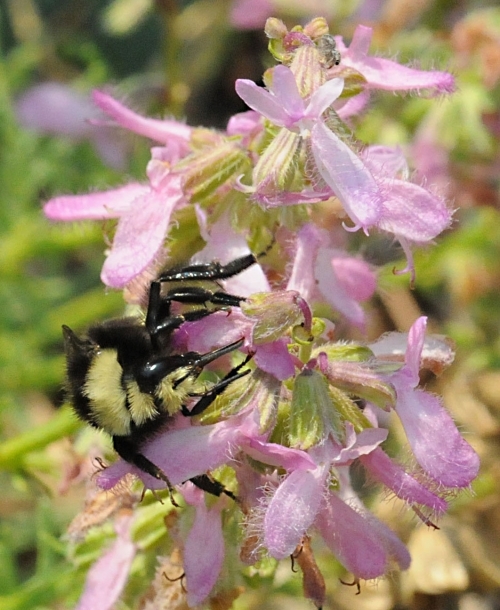 Members of the Xerces Society, an international organization "dedicated to protecting biological diversity through invertebrate conservation," are keen on protecting the habitat of native bees and other native invertebrates. As part of their public outreach program, they publish books, pamphlets and fact sheets. These include Pollinator Conservation Handbook, Farming for Bees, and the fact sheet, Bumble Bees in Decline. 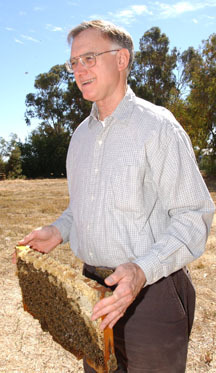 As for the bee condos, thousands are sold each year in the United States, according to entomologist Mace Vaughan, pollinator program director of the Xerces Society, based in Portland, Ore. As concern for the environment grows, more and more farmers and urban gardeners want to attract and accommodate the native bees. 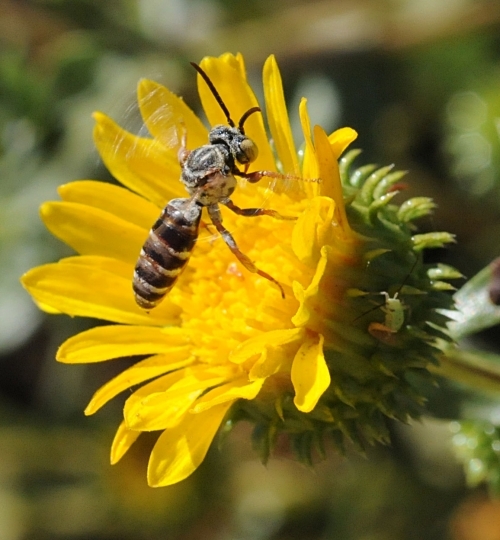 Native bees are important crop pollinators, Vaughan says, and the work people do on behalf of the pollinators also supports other beneficial insects and wildlife. Vaughan, who escorted a group of us on a recent Yolo County farm tour, said many of our native bee species are much more efficient than honey bees at pollinating some crops. Native bees sport such names as miner, carpenter, leafcutter, mason, plasterer or carder, reflecting their nesting behaviors. See the bee (below) heading toward the bee block? 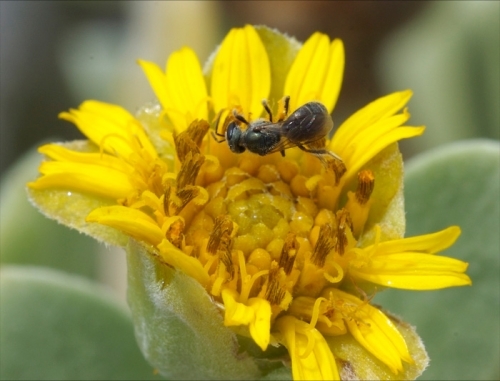 Xerces Society member Robbin Thorp, emeritus professor of entomology at UC Davis who researches native pollinators, including bumble bees, says this is a female leafcutting bee, "probably the introduced Megachile apicalis, a specialist on Centaurea species, especially yellow starthistle." The leafcutter bee, as its name implies, cuts leaves to form its nest.